Parent View is an online questionnaire that allows parents and carers to give their views about their child’s school at any time. It is also the main mechanism for parents to give their views about their child’s school to inspectors at the time of a school inspection. The questionnaire can be accessed directly from the Parent View site at https://parentview.ofsted.gov.uk or from the home page of Ofsted website at www.gov.uk/ofsted. On parents evening, a large percentage of you completed the parent questionnaire and feedback form and we appreciate that you did. Your views are very important to us. We appreciate and value all feedback so that we can continue to improve the educational experience that we provide for your children. Please find below the results of the questionnaire, which were overwhelmingly positive and we thank you for that. Rest assured we will be working tirelessly to ensure that any concerns raised during parents evening are addressed. Please come into school to discuss any concerns that you may have. We are here to help and are always available. We know from your feedback that our school is a safe place for your children. We pride ourselves on the fact that our pupils feel safe and happy and are ready to learn. This was the highest scoring area of the questionnaire with 84% of parents strongly agreeing. This was a 2% improvement from last time and something we are very proud of! We are glad that you think your children are taught well and make good progress. This is particularly pleasing as all returned questionnaires either strongly agreed or agreed with those statements. A 100% success rate is certainly something to celebrate. We have made several changes to the way we provide homework and this has been recognised by the parents/carers. We have tried to make the homework more interactive and purchased Times Table Rockstars which we know is having a big impact. We will continue to try and improve in this area. We understand that bullying happens in every school and we always work hard to address issues of bullying effectively and efficiently. It is pleasing when so many of you completing this questionnaire recognise the significant amount of time and effort we have invested in improving how we deal with the small number of bullying incidents we experience. The feedback we received in this area was very pleasing, particularly one parental comment which said: “the school deals with bullying brilliantly”. Almost all parents agree that we respond to any other concerns they may have. However, as a school we need to concentrate on the small minority of parents who disagree. And we will! If you ever have an issue or concern, it is vital that you speak with your child’s class teacher, Mr Leach, our Designated Safeguarding Lead, myself or any other member of staff promptly so that the issue can be resolved and appropriate action taken. Our doors are always open. It is extremely positive that 98% of you felt that you were kept up to date with what is happening in school. We have a fantastic Twitter feed, a great school website and weekly newsletters in place to keep you as up to date as possible. Lots of hard work has been put into this area and it is pleasing to know that it is recognised. We are working hard to further develop our relationship with you, the parents of our children, and take on board some comments you made about providing more notice for some of the activities and events we offer. We do try to do this but sometimes we are not given much notice ourselves. Please check out the calendar on the school website for events taking place up until the Easter holiday. I would like to take the opportunity to direct you to Ofsted’s Parent View website. 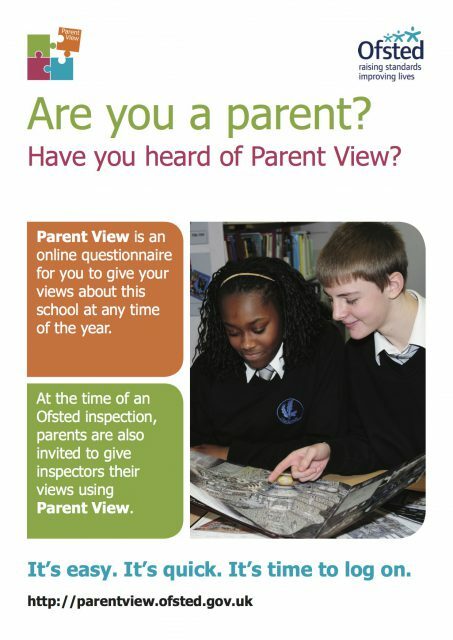 Parent View is an online questionnaire for you to give your views about this school at any time of the year. It’s easy, it’s quick and it’s a great way of sharing with Ofsted what a great school Florence Melly is. Once again, thank you for the fantastic support you have shown. A big thank you to those parents who attended the Online Safety Session with Paul Bradshaw. We really appreciate your support and hope that you left with some practical strategies to best support your child/children to be safer when they go online. The feedback from parents was extremely positive and as a result, we will be offering further sessions later in the year. If you have any questions or concerns relating to online safety, please do not hesitate to contact Mr Leach, our Designated Safeguarding Lead, who will be happy to help.